MICROBE-LIFT/Herbtana is a unique, herbal, immune-enhancing stimulant, which reduces: skin flukes, gill flukes, Ich, Oodinium, Costia, Chilodonella and Trichodina. Parasitic infections are characterized by symptoms, such as: milky skin, flashing and heavy breathing. Parasites are generally present on most fish at very low levels at all times. These are naturally controlled by the fish's immune system. When stress levels increase, the ability of the immune system to respond to its requirement to control the natural level of parasites is directly affected. This poor response allows parasites to increase in numbers, thus causing any of the serious above mentioned health issues in the host fish. 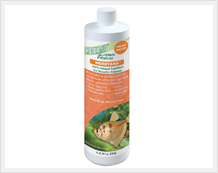 MICROBE-LIFT/Herbtana supports the fish's immune system, driving off the excess parasites. Since they cannot return to the fish during treatment, the majority of the parasites will starve without a host.